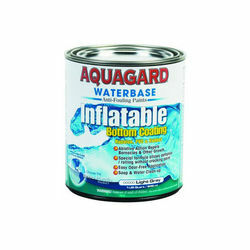 Aquagard Inflatable bottom paint is suited for Hypalon, PVC, and rubber inflatable boats. It's special formula allows boats to be deflated and rolled up without cracking the paint. Ablative, anti-fouling properties protect against barnacles and other marine growth in both fresh and salt water. This water-based coating provides easy clean up with soap and water. Apply Inflatable bottom paint with a brush or roller. Available by the quart in light gray. One quart approximately covers two coats on an 8-10' boat. can it be thinned out with water? Yes, you can thin if needed with a little water. will paint still be active after numerous launch / recoveries? Inflatable stays in water most of the summer. When I pull it out to store it for winter everything except paint comes off with little scrubbing. Sorry, no item referenced to provide an answer. I keep mine in the water all season, which is why I needed the anti fouling. That part works great, and lasts all season. It does not strip off easily in the fall, so I believe it would handle some rubbing from in / out on a trailer. What sort of preparation is necessary before I apply to the bottom of my PVC inflatable ? Clean the bottom well with soap and water. Let dry and apply.